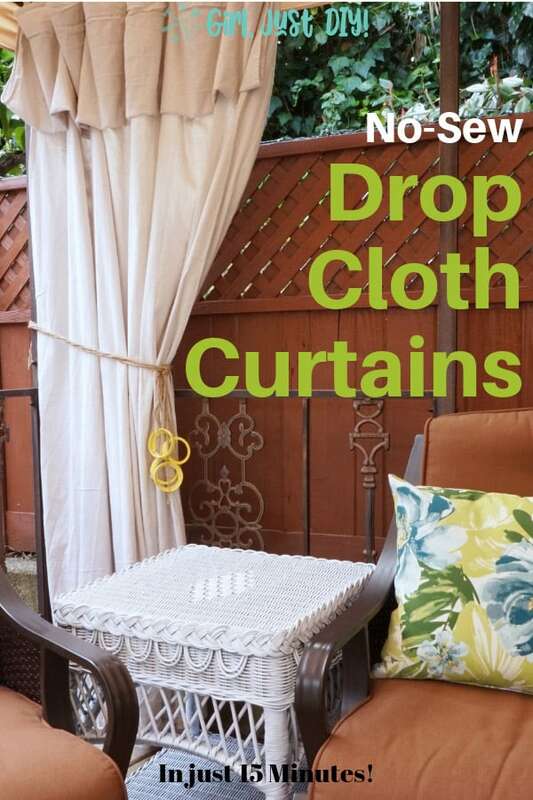 Drop Cloth Curtains - My Patio Refresh Part 3 - Girl, Just DIY! 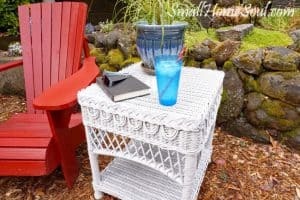 Welcome back for Part 3 of my patio refresh project. Today it’s all about curtains, Drop Cloth Curtains to be exact. 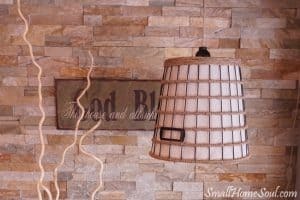 So far I’ve shown you how to Paint a Seagrass Rug and How to Repair a Wicker Table and today I’ll show you how I made these super easy no-sew drop cloth curtains in less than 15 minutes. Last month I bought two drop cloths for a blogger challenge intending to make curtains for my bedroom but ended up instead making a Stenciled Pillow. My plan for this Patio Refresh was to use mostly what we already had and a little paint. I had to purchase one drop cloth to replace the one I used to make the pillow. I had already purchased the clips from before so this project cost me only the price of one drop cloth, or $10. As a reminder here’s where we started. Do you see that bamboo at the top? That’s what I was using to hold up some tab top curtains I made. Well, they weren’t my best work and neither was that bamboo so they both had to go. I’ll be re-purposing the curtains into a table cloth for our patio dining table. More on that later but now back to today’s project. With the failed bamboo idea I needed to find a new/different curtain rod. Thankfully I never throw anything away. Seriously, it drives my husband a little crazy. But this broken curtain rod, missing one of it’s cute crystal finials, that used to hang sheers in our daughter’s room, that’s been propped in the corner of the garage by the door? Yes, that one! It’s perfect because it’s long enough to span the 12′, buh bye sad little bamboo. I used a hammer to knock off the one remaining crystal globe and gave it a good spray paint with some left over brown Rustoleum paint I had so it would blend in with the frame of our gazebo. When I say left over, I mean between two cans I barely had enough to get this thing painted. Moving on to hanging this salvaged curtain rod. It wasn’t easy to get this hung by myself but a girl will do what she has to do to get the job done. I propped one end on the rail while I securely fastened the other. We always have an coffee can full of heavy-duty zip ties in the garage, but they’re all white. Since we have our lights strung year round, plus the tan velcro tabs that hold the gazebo top in place, I wanted the least visual clutter possible. So I got out my handy black sharpie and colored them. They almost disappear, plus most people won’t be sitting there with their craned necks staring above their heads. So we’re good. Oh, I nearly forgot to mention, don’t forget to slide on the curtain ring hooks before you install your rod. Ok, hard part is done, the rest goes pretty quickly. I had already washed and dried my drop cloth (for shrinkage) so I was ready to hang them. I didn’t take pictures of these steps but since my drop cloth is 9′ tall and my gazebo isn’t, I had to fold it. I folded the top toward me and held it up to one of the clips and kept adjusting until they were hanging about 1″ from the ground. After I got the right height I was ready to start clipping them to the rod. You can use as many rings as you want, I already had two packs of seven so I used seven per side. Just make sure you use an odd number, you’ll know why in a minute. Clip each side of the folded drop cloth to the outer rings for the side you’re working on. Slide the outer rings together to find the center of the drop cloth and clip it to the center ring. Spread out the drop cloth between the far right and the middle ring clip, now eyeball the placement of the other two so you have 3 equal sections. Repeat step 3 for the left half of that drop cloth panel. Step back and make sure you like how the bottom hangs, make any adjustments necessary at each clip to raise or lower the bottom hem. It’s a patio, so it doesn’t have to be perfect. Plus the tie back will hide imperfections. Now for the fancy part. Starting on either side of the panel grab the loose end that you folded toward you as you hung the panel. Holding the clipped curtain pinch the clip and slip the loose end under and into the clip. Move to the next clip spreading out the curtain as you go so they are smooth. This is what your curtain will look like. I needed some tiebacks for my drop cloth curtains so I grabbed a roll of Jute string I used on another project, but one strand would look to puny. I wrapped it around the gazebo frame and the curtain and found the right length. Then I cut a total of 14 lengths, seven for each side. I twisted seven strands around a few times until it looked like a rope. One was tied around the curtain panel and the gazebo frame. Moving to the other panel I made sure the other one had the same drape at the top so they were visually even. All done and pretty nice! I added some yellow mason jar rings for a little extra color and stood back to admire my work. There you have it, no-sew drop cloth curtains in less than 15 minutes. 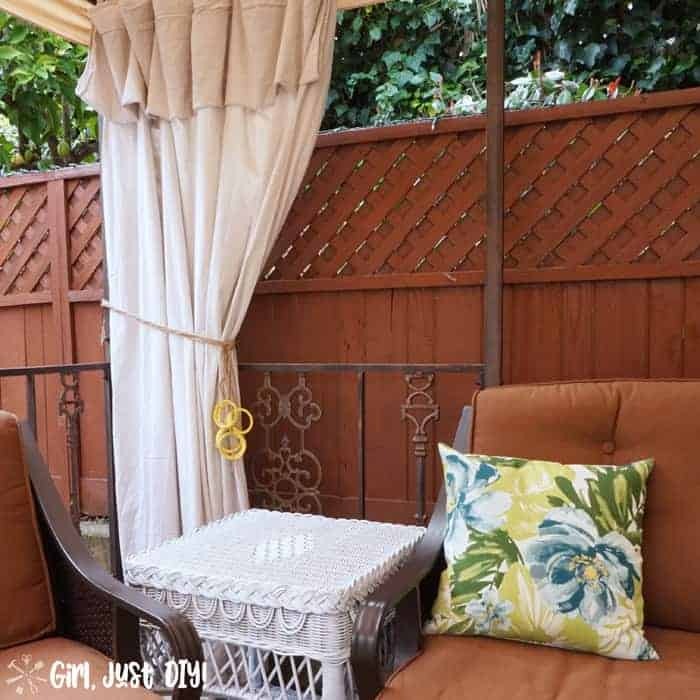 Don’t forget to check out my Patio Refresh Part 1 and Patio Refresh Part 2 and be sure to Pin this project to your favorite Curtain or Drop Cloth board. 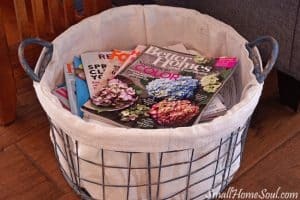 You might also enjoy some tips on creating a Relaxing Retreat and how I turned our old Old BBQ into a Patio Cart. And even more ideas for Painting a Rug. These look great Toni! You go girl! I love how you are transforming your backyard! Anything with dropcloths is great, this is a fabulous post! I love them!! I used that same technique to hang sheets as curtains in our bedroom. Much more economical than purchasing the real thing! The curtains are great. I wouldn’t mind having these in the house. The patio looks very comfortable. It is certainly an outdoor living room. 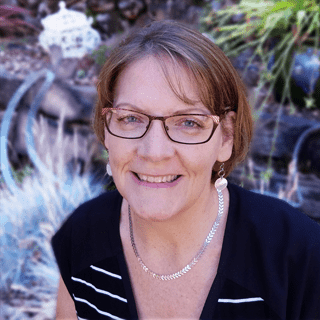 Hi Debra, thanks for the kind words! Yes, I could totally put them in the house now. 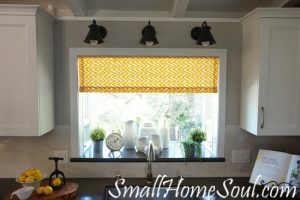 Curtains longer than 84″ are hard to find and these fit the bill perfectly. Thank you Stacey, I can’t wait to host our first get together out there. 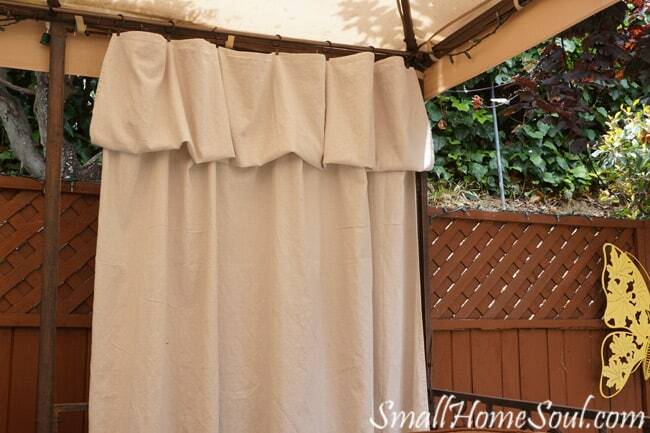 Toni….your patio makeover is coming along and these curtains are awesome! Nice job girl. ? Thanks Denise, I’m feeling like these might work in the house after all ? I love these ! High 5 girl! Thank you Lisa, you inspired me with your beautiful curtains.